Imperial Highness is set in eighteenth-century imperial Russia and centres around the life of Catherine the Great and her Romanov descendants. Against this Czarist background, Evelyn Anthony vividly recreates the deformed and immature figure of Grand Duke Peter, to whom Catherine was first betrothed as a young German princess. And to whom she became a wife in name only. Alongside him, the dazzling person of Catherine herself is made to live again: a woman who dreamed of leaving her name in the annals of world history even as a child.Whether as wife, mother, lover or future Empress of Russia, the role of Catherine Alexeievna is never without colour. 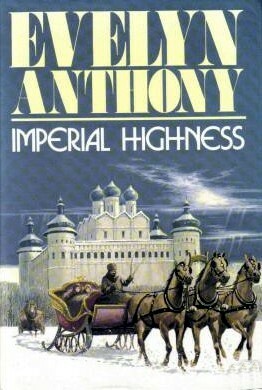 And in Imperial Highness, Evelyn Anthony captures the personal fascination of her subject while also telling the story of Catherine's adulterous love affairs, and the struggle for the imperial throne. Some times when I look at the recent and upcoming historical fiction releases I scan through looking for something other than yet another Tudor book, or this year in particular another book about Eleanor of Aquitaine and I wonder why there aren't books about some of the other fascinating characters in history. For example, I cannot for the life of me figure out why there are so few books around about the life of Catherine the Great, Empress of Russia. Here we have a strong, beautiful, charming and beautiful ruler clad in fabulous clothes and jewellery who ruled her land for many years- everything that a queen is supposed to be really. She lived a very dramatic life filled with tension, conflict, lovers and scandal, led her country into a period of learning and culture and so much more. I was glad to see that next year there is going to be a new book on Catherine, but in the mean time I was even happier to see someone reference this book on Goodreads. My own library doesn't have this book but fortunately I was able to borrow it through inter library loan. If you don't read any further in this review, the fact that I have already requested the next book in the trilogy, also through ILL, should tell you that I enjoyed this first book very much. Young Princess Augusta Frederica was from a very noble, but very poor family in what is now modern day Poland. When she is summoned by the Empress Elizabeth of Russia everyone knows that it will likely lead to marriage, but for the young princess it is also a potential way out from underneath the harsh control of her mother and her very pious father. Upon arrival in Russia, the young princess takes the court by storm, with one exception. Her future husband Peter, nephew and heir of the Empress Elizabeth, takes an instant dislike to the newcomer, and so a relationship that will be the source of much scandal over the years to come is formed. The Peter portrayed in the book is maniacal, immature, ill-formed and basically unsuitable for his future role as Emperor of Russia, particularly because of his very Prussian views and loyalties. For Elizabeth though, she sees no choice but to keep him as her heir, and initially she see the young princess that she has named Catherine as a possible positive influence on Peter. She could hardly have been more wrong. However the Empress also had a somewhat changeable nature and it doesn't take much to upset her, so Catherine goes from being in favour to very much out of favour, especially given that the marriage between Catherine and Peter does not and can not provide the one thing that Elizabeth desperately needs from them - a legitimate heir. One of the questions that I have thought about off and on over the years is one related to time travel - Where and when would you like to travel to if you could? While I always struggle to the where, I always know what I wouldn't want to be - a noble. Being highly born seems to have been quite treacherous in many countries and the imperial court of Russia was no exception. When there was no baby forthcoming, the Empress Elizabeth had the couple basically locked up together for years in the misguided hope that there may at last be a child. Time and again Catherine was bought before the aging Empress and feared for her life having offended the ruler in some way or another. Then again, I wouldn't really have wanted to end up as a serf either, so maybe I will just stay in the comfortable surroundings of here and now. Years later, when finally freed from captivity, we see a much harder, much wiser Catherine, but also a woman who knows what she wants, and this includes various lovers! Catherine had used her time in captivity to educate herself and emerged having studied many of the great minds of the age. She was still young, still beautiful, intelligent and above all ambitious! And with her husband seemingly barely capable of controlling himself let alone an entire empire, the Catherine that we know from history emerges to take control. The book closes with Catherine coming to the throne, ably assisted by those loyal to her including her powerful lover who orchestrates the bloodless coup. I wouldn't say that I am particularly knowledgeable about the life and times of Catherine the Great. Even just a quick look at a few websites after finishing the book seems to indicate that there are some discrepancies between the history portrayed in this book and what actually happened, but when all is said and done, this was a really entertaining read full of dramatic moments, court intrigue, passion and ambition, and this reader was left wanting more! Please note that this book was also published under the title Rebel Princess, and is the first book in the Romanov trilogy. My only question is this- Did you like War and Peace and does it read anything at all like that? If not, then this sounds like a great series to delve into!! Nothing like War and Peace! More about personal intrigues rather than the bigger war pictures. I have a copy of this thanks to Tara and hope to get to it soon. I'm still slowly plodding away at the Robert Massie book on Catherine (it's good, but NF doesn't keep me riveted). I've already had a chance to read The Winter Palace and had issues with the narrative. Catherine is not the main focus. Great review! I'm really keen to read this, I don't mind if it's not 100% historically accurate - that's why it's fiction, after all. I have long been interested, fascinated really, with Russia. I took more Russian literature courses in college than American (or any other country, for that matter). So, I'm greatly interested in this book which you've reviewed and given so many stars. Wonderful! This sounds like an amazing book, and now I want to read it too! I love that you are already addicted, and now I need to see how I can get my hands on a copy of this one. Fantastic review today, Marg! You've gotten me so excited! Whenever I see a review of a book about Russia written by an author who is not Russian I'm always curious but cautious - don't want to read something that is a literary equivalent of American actors pretending to speak Russian in movies (being a native speaker can be a curse). This book appears to be well-written so I'll add it to my list despite the historical inaccuracies. After all, how many historical novels follow facts without fail? Thank you for the review!